Youth, Romance, Waves, Cafes, Park Benches, Music of the Hour... And the Sunset in Your Cup. You don't need any more than that to make some memory. Wolmido have everything you need for love, for her or for him... The Romantic candle light itself, Wolmido. Wolmido is a famous sightseeing place filled with beautiful ocean views, mountains, pleasure boats and colorful sunsets. Waking on the Ocean Daehakro (approx. 1 km long) that is lined up alongside with widely open aqua blue seas on the right and exotic cafeterias on the left, you will fully enjoy freedom and happiness. The theme park having various amusing structures like Biking and Bumper cars is an 'Eruptive canal of youth'. Through the Chinsoo space where there are many rough rocks and a red baby lighthouse, you can reach the exit to the ocean. Wolmido is a popular hang-out spot for local youths. Art performances are often held along the Culture Street which stretches along the sea, including concerts, singing and dancing contests and much more. 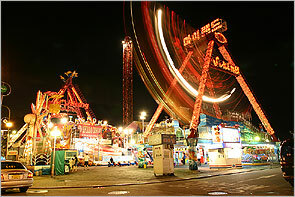 Everyone is welcomed to join in friendly contests, and there is also a carnival with a bunch of rides. Illuminated by multicolored lights, the place is always reverberating with music and children's laughter. Along the coast is a tempting array of restaurants and cafes. Many people visiting the island enjoy sitting on a mound of rocks to watch the sun go down past a red lighthouse and between other nearby islands. Wolmido was named after its shape resembling the tail of a half moon. As it has been a military strategic point since long ago, it has been the home of many batteries. It also was the battle ground of Japan and Russia during Korea's first opening of foreign trades. 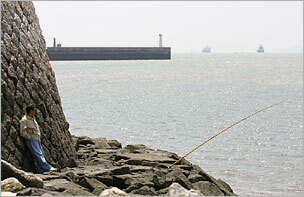 It was used for a military base during Japanese Colonization, but it has been recognized as a tourists' attraction as a stone embankment was constructed to connect it to the inland in 1918. Wolmido attractions included Seawater Bath with heated seawater, beaches, a zoo and Yonggung Pavilion (Yonggunggak) that looked as if it was floating in water during the high tides. However, as it was the core of Incheon Amphibious Operation during the Korean War, all of the attractions were destroyed by countless attacks. After the placement of a military corp., it was rarely visited by civilians; but as 'Street of Culture' was formed in 1989 and the military corp. was withdrew from Wolmi Mountain in 2001, it is regaining its reputation as a tourists' attraction. It is particularly visited by many tourists as Incheon International Airport was opened in Yeongjong Island, an island close to Wolmido. Wolmi Island's Street of Culture was newly decorated to become a better attraction for the public. 10m-high water fountains from the ground invite many people to the world of childhood memories. Yeolju, the colume of lights, dress up differently from time to time to brighten the beautiful nights of Wolmi Island even more. Also, the outdoor stages invite many youths for performances and gather audiences for great festivals. Cultural Streets of Wolmido has been alluringly 'made up'. Yeolju is the hero of the ceremony decorating the night sky of Wolmido. Columns of light formed by seashore streetlights now brightly illuminate its nocturnal contours. 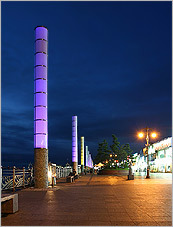 The 15 light pillars are ceremoniously lined up in a section of 350m from the 2-nd dock to the open-air stage in the center of Wolmido's cultural quarter. Pillars 10m in height and 80cm in diameter stand at 23m-intervals, casting their wide-eyed incandescence toward the night sky and sea. Wolmido's light columns so continue their vigil through the night, conversing yearningly with the far-away Incheon International Airport control tower beacon. It will be a special enjoyment to view the night views of this beautiful Wolmido from the port of Yeongjong Island or on the ferry to Yeongjong Island. The accompanying rainbow-colored, light-projected fountains continuing on a 100m stretch produce an eerie impression of light sprinkled from up above, showering down onto the water and to the ground. There's an outdoor stage at the end of Street of Culture. Once you climb up to this stage, the sea will be your background for your performance. The artistic feature will be even more distinctive with the help of nature. You will find out the thousands of colors of the sea as time passes all the while enjoying the performances. You don't have to contact anybody to reserve the stage, just be there, then you become the artist and people the audiences. This is the place which makes Wolmido so full of life. Many young people are hanging out in this place having a good time. You can laugh with other people whom you never have seen in your life before. Just looking at the Viking will make you dizzy. The Wolmido Viking is famous around the nation for being exciting. The Apollo Disco is extra fun whether you are riding or just watching. 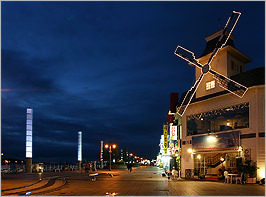 If you want to enjoy the romance of the night, try the amusement park at Wolmido. If you think it's too scary to ride, just watch others do and you can get happy. Not only the "Street of Culture" stretched along the coastline, but also the seas viewed through wide windows over sound music and scents of coffee are indescribably impressive. Although the cafes are forming a line along the street, you are lucky if you can sit by the window. It is great to appreciate the seas resting your tired legs and it is also fun to observe the people moving hurriedly in search of something exciting. Share a moment of your life with the energetic people. Empty sacks will never stand upright! Forget the tiresome life with fresh flatfish and rockfish right from the water tank over a shot of Soju. It will be absolutely great to taste a piece of raw fish dipped in vinegar and pepper paste sauce and seasoned with the friendly story-telling of the servers. Night at Wolmido is extremely exotic... The cafes and restaurants along the coast create a unique atmosphere like those of the Mediterranean. Most of the cafes at Wolmido are designed with windows from floor to ceiling so that the ocean can be seen while the patrons are dining. Located next to the outdoor stage on the Street of Culture, it is a pile of variously-sized rocks into the sea, so you can approach the sea dipping your hands to get closer to the sea water. Listen to the sounds of sea waves from far away or view the sunset beautifully coloring the skies for great impressions. This water-friendly park is indeed a place to befriend the sea. There are paths leading toward the sea and the seawater inside the area provides a foretaste of the ocean. Rugged rocks are snuggly arranged, highlighted by a red miniature lighthouse. The waves, though not quite like ocean waves, beat the shore and splash, like a diminutive version of the wilderness lying further ahead. 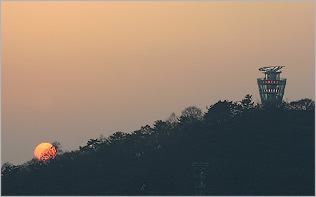 From atop a rock, one can obtain views of tour boats cruising the sea and glimpses of the Yongju, ferrying back and between Yeongjongdo and Wolmido Islands. While the site is wonderful for contemplating the sea from at anytime of the day, catching the sunset from here is an experience one would not regret. The beautiful sunset, which can be viewed from everywhere in Wolmido, is a gift of impressions. Wouldn't it be unforgettable to appreciate the sunset with your family or lover on a bench among the winds of the seas, in a cafe with sweet melodies or on a ferry followed by singing seagulls? You will be able to feel your heart burning as a furnace flaming up to the sky. If you prefer to be away from the crowd, it is also good to view the sunset on the coastal way extending from the eastern end of Wolmido along the seas. The fiery afternoon sun gradually sinks down to the sea, still ablaze casting its last minutes of incandescence of the day. On its way out, it turns everything crimson: sea, boats, islands, and the face of the loved ones. The glaring agony of the setting Sun, for a while almost protracted, all of a sudden comes to an abrupt end, as it completely plunges into the sea, leaving only a long crimson trail, lingering after its exit. The sunset at Wolmido is as ardent as the infatuation of those young lovers in love for the first time in their lives. Caught in its flame, we all become heroes and heroines of a love epic. Be it while sitting at a cafe, from the water-friendly area, or clinching on a parapet on high, the spectacle of the Island' sunset leaves no heart unkindled by its passion. After 50 long years, Mt. Wolmisan has been returned to Incheon. Pummeled by naval bombardments during the Korean War, it has finally recovered its original appearance and will be receiving visitors again. Wildflowers whose names are as poetic as their blooms are beautiful -lilies of the valley, bellflowers, dayflowers and cherry bells adorn the mountain, which is about 9 times the size of Jayu Park. And Incheon, when seen from the top of Mt. Wolmisan, finally gives itself away in its full scope. The view stretches out into a panorama of mountains and sea to land's end, and is well worth the trip. To reach the peak, one can either adopt the paved road skirting around the mountain in full circle, or the dirt path... Whoever stands on this summit, 108m above sea level, will discover something new about Incheon's beauty: the port, Jayu Park, downtown streets, Mt. Munhaksan, Mt. Gyeyangsan, and Incheon International Airport from far away with gleaming dragonflies landing or taking off. 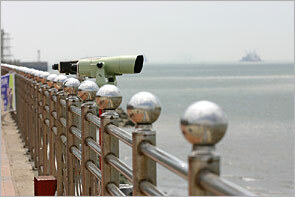 On a clear day, one can see all the way to Gaeseong, across the cease-fire line to the north. 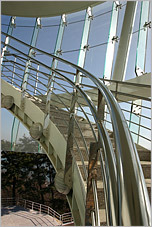 Wolmi Park is one of Incheon's rare natural ecology centers. It is literally a natural classroom of ecologies with varieties of animals and plants. As many as 264 species, including mammals such as racoons and wild birds such as kestrels - a natural memorial - and eagle owls are found. Also, numerous tree types, including oak trees, P. sargentii and Korean white pines are growing in 293700 m2 -wide lands. Wolmi Park is good for family relaxation. A mat spread along the cool winds from the seas makes a great table and resting place. Share the warmth with the laughter of your family over simple picnic snacks. Everybody becomes friends and family in this space of sharing. You can even prepare a simple picnic at the convenience stores located nearby. There are two boat routes available to appreciate the offshore view of Incheon (the Cosmos and the Harmony). Tour boats departing from Wolmido follow the itinerary of Incheon Port Floodgate - Yeonan Harbor - Return to the port from outside Palmido Island - Muuido Island - Yongyudo Island -Yeongjongdo Island - Gyeongin Energy past Incheon International Airport - Jakyakdo Island after making a roundabout in front of the Yeongjong Bridge, for a cruise of 1 hour and 20 minutes. One can see airplanes taking off from Incheon International Airport, while, at Yeongjong Bridge, one can admire its awesome, stately build. The tour boat Cosmos features an onboard self-service restaurant serving semi-formal to casual meals and a coffee shop, and large and small banquet rooms. Tour boats now run from Yeonan Pier! The one-hour itinerary starting from Yeonan Pier covers some of the most scenic sites of the area - Incheon Port Floodgate - Wolmido - Yuldo - Yeongjong Bridge - Jakyakdo - Incheon Int'l Airport taking you back to Yeonan Pier. Festivals are center of collaborations where you can enjoy the things to see and taste and the passions of culture. 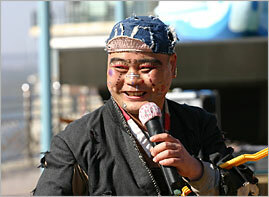 You can participate in various festivals at Wolmido. Wolmido and Jayu Park (Freedom Park) are covered with cherry blossoms every April. The parades of Naval Guards of Honor and Military Band, Cherry Blossom Wedding Festival and Original lajangmyeon Eating Contest are just a few examples of our events and various culture and art events harmonizing with the cherry blossoms notify the coming of bright spring. Enjoy the excitement within the warm spring breeze. There is a local buses to Wolmido : 2,15,23,45. All those buses stop at the "Incheon Station" and "DongIncheon Station". 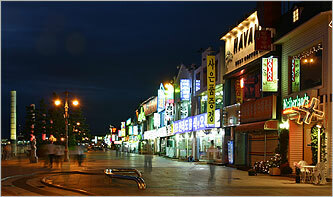 From the Incheon Int'l Airport, you have to go to Yeongjong Wharf by bus No.202 or by taxi. Stop of the bus is on the 3-rd floor of the airport near Exit 5. I repeat again : on the 3-rd floor, not the 1-st one, where most of buses departs. You can see the bus No.202 stop on the map of the 3-rd and the 4-th floor and the bus route on Yeongjongdo island map. Then the bus makes a short circle around transportation center and goes to Yeongjongdo Wharf. Time 30 min, fare 900 won, schedule is here). Before you take a taxi read my comment. 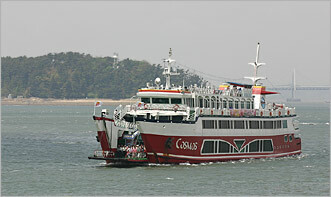 Then take the car ferry Yeongjongdo - Wolmido (15 min, fare 2000 won).